The Vilas properties are India’s most famous and celebrated hotels. 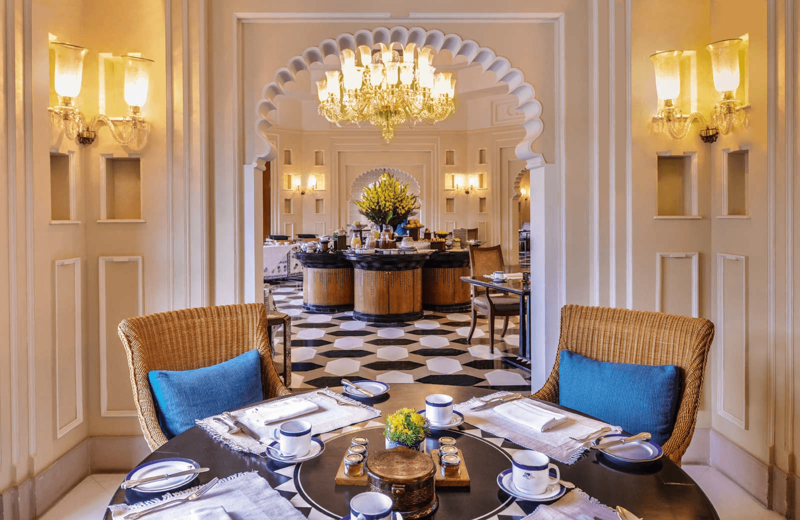 Ever since the first one - The Oberoi Rajvilas, Jaipur, opened in 1997, the Vilas properties have revolutionised hospitality in India and have regularly been rated as among the world’s finest hotels. The creation of the Vilas properties had its roots in an old fort that Mr. P.R.S (Biki) Oberoi, Executive Chairman of The Oberoi Group, bought in Rajasthan. While he was restoring the fort, he made several trips to the state to oversee the work. Most times he would stay in one of the so-called grand hotels of the region. Often, they looked grand as they had once been palaces, after all, but the guest experience was pathetic. Eventually, fed up of suffering on each trip, he began to take his own towels, his own sheets, packed food cooked by his own chef and even toilet supplies. The experience got him thinking - why didn’t Rajasthan, the centrepiece of India’s tourism offering, have world-class luxury hotels? The more he thought about it, the more bemused he got. Surely, it couldn’t be that difficult to run a good hotel in Rajasthan? From that experience, came the idea for the first Vilas: The Oberoi Rajvilas, Jaipur. He built it to standards of luxury that were at the cutting edge of the international hotel industry and soon turned it into a global destination hotel, giving Rajasthan’s capital the hotel it had always deserved. Other Vilas properties followed in quick succession. There was The Oberoi Vanyavilas, Ranthambhore next to the tiger reserve of Ranthambhore. The Oberoi Amarvilas, Agra became famous all over the world for its design: you could see the Taj Mahal from most of its rooms. Wildflower Hall, Shimla in the Himalayas – An Oberoi Resort at the foothills of the Himalayas, offered a taste of the Raj updated to modern global standards of luxury. 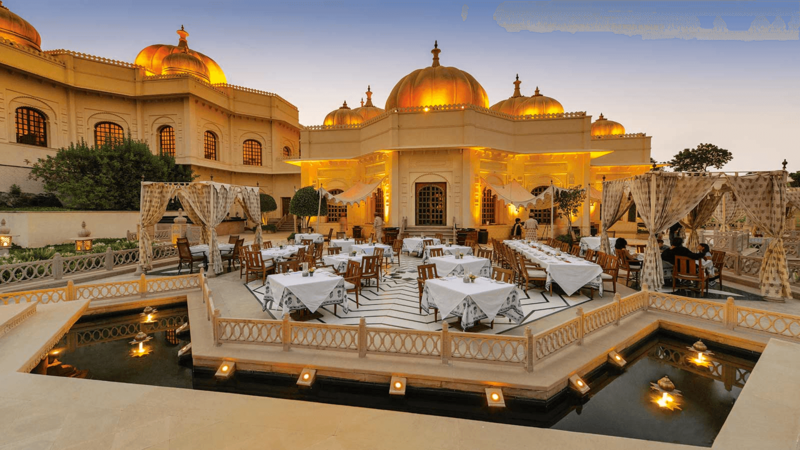 When it came to Udaipur, one of the world’s great destinations, a gem of a city that preserves the ethos of Rajasthan, Biki Oberoi was faced with a choice. Should he build a modern palace? Or should he do something more adventurous and daring? Naturally, he chose to do something much more daring. Next to Lake Pichola, the water body that is the heart of Udaipur, and directly across from the Maharana’s palace, lay 50 acres of forest land. In the old days, this had been part of the hunting grounds of the rulers of Udaipur. When hunting was banned in India, the area became a hilly animal-habited forest. It had never been developed because the land was uneven and rocky. Construction would, by definition, be difficult. Besides, who would want to build on such uneven terrain? And local laws required many of the trees to be protected, making any development a complex and tricky task. 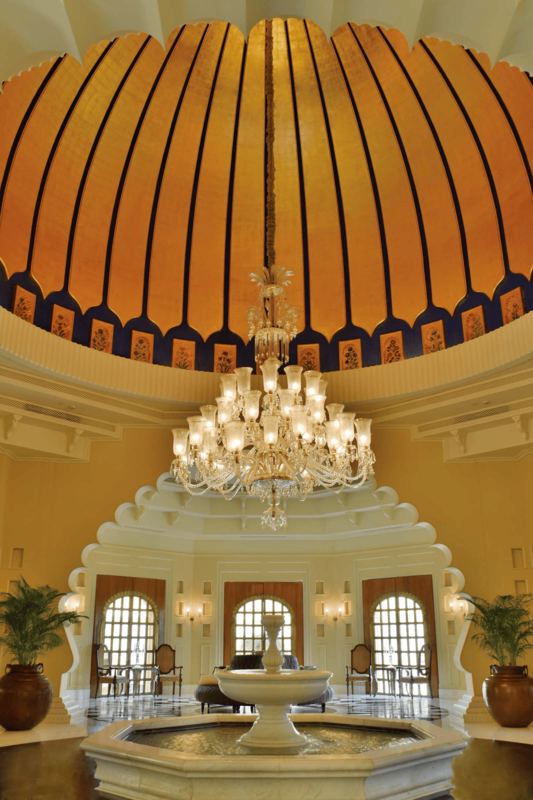 Biki Oberoi’s solution was to build a hotel that was unlike any that he had ever built before - perhaps the first of its kind in the world. He set aside 30 acres for the resort complex and decided that it would have just 87 rooms. That meant a ratio of one acre to every three guest rooms - more or less unparalleled in the hotel world. Then, he resolved to protect the existing trees and to plant thousands of new ones. His resort would have the grandeur of a palace but would be one with nature. You could stare at blue skies, smell fresh air, walk on green grass and see trees nearly everywhere you looked. Not only would the hotel be one with nature so that it rose organically from the hills, he would also keep it low. There would be just one storey to most of the wings - because the hotel was built on hills, the natural topography of the land meant that some rooms would seem higher than others. Because he had so much space, he built The Oberoi Udaivilas, Udaipur almost like a small, sparsely populated city, with gardens and courtyards everywhere. To keep in with the sense of location and place, the hotel was built almost entirely from local ingredients. Every design element was derived from an Udaipur tradition and much of the workmanship was artisanal. Local handicrafts and works of local art were liberally strewn around the hotel - each room had at least one magnificent piece - and sometimes guests had the sensation that they were on an artistic tour of Mewar, the region that Udaipur is a part of. 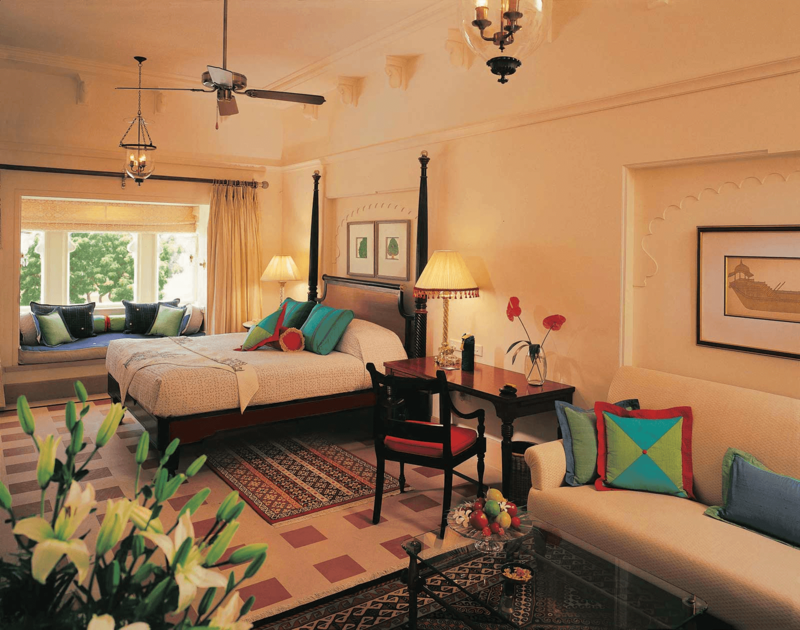 Of course, Biki Oberoi is a master of luxury, so all this was combined with unparalleled levels of luxury. The entry level room is 600 square feet (twice the size of most hotel rooms). A full one-third of all rooms and suites have either private or semi-private pools. Every single room has a sit-out area, many with views of the . It was no surprise that when The Oberoi Udaivilas, Udaipur opened, it quickly became one of the world’s most celebrated resort properties. It has won too many awards to mention. But one is worth remembering. In 2007 and 2015, The Oberoi Udaivilas, Udaipur was ranked as the best hotel in the world by the readers of Travel + Leisure magazine. Since then, it has rarely been out of most rankings of the top 10 hotels in the world. In 2015, the readers of Condé Nast Traveller in the UK rated it as the second best hotel in the world. In 2009, Forbes rated it among the World’s Most Excessive Hotels. And in India/Asia, it has won every award worth winning. 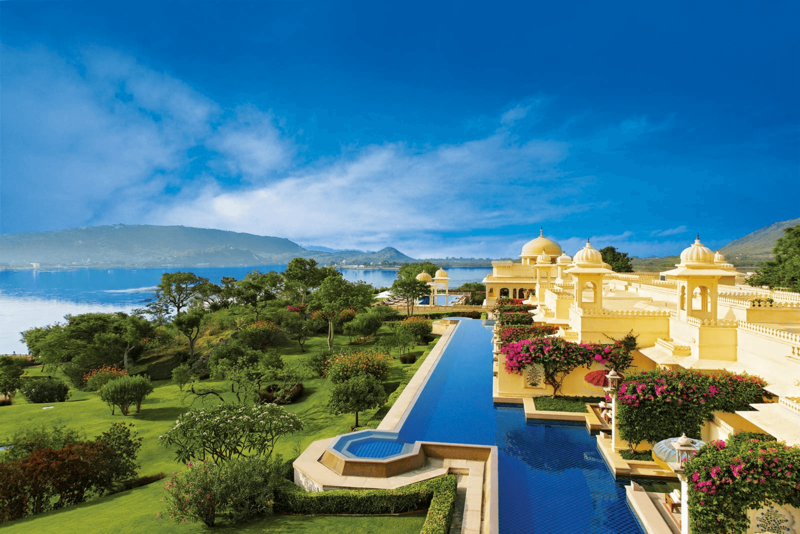 I first went to The Oberoi Udaivilas, Udaipur, in 2007, and was blown away by the sheer ambition of the venture and the brilliance of its execution. A decade ago, it seemed like a clear breakthrough in the world of hoteliering. I have been back thrice since then, and have loved it each time. 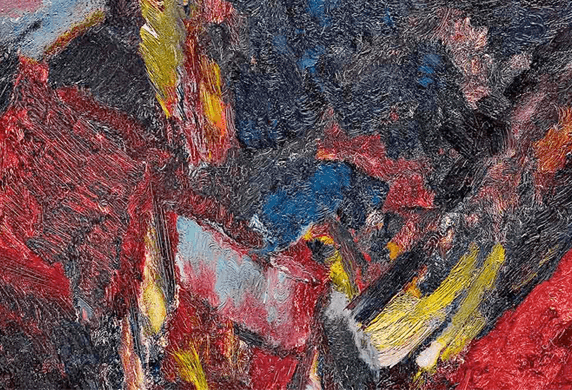 But when I went back this time to write this piece, I went with a more critical eye. Had the hotel maintained the standards that made it famous? Did it still seem so impressive and so precedent-shattering? The simple answer is yes; it took my breath away, again. There is, first of all, the romance of the welcome. You arrive at the City Palace end of Lake Pichola at The Oberoi Udaivilas, Udaipur’s own boat jetty. The staff are expecting you so there are cool towels and cold (or in the winter, warm) drinks. Your luggage is quickly loaded into one of the hotel’s boats and you make the journey across the lake to another more ceremonial welcome at The Oberoi Udaivilas, Udaipur. Check-in is smooth and effortless. They give you a glass of champagne and you either sign the registration card under the massive chandelier that dominates the reception area or they walk you to your room, past hundreds of artefacts and a few cooing peacocks, and let you sign the registration on your own desk. From then on, it’s an adventure. Assuming you don’t want to use your pool (if your room doesn’t have one, the hotel has two other large pools), you should explore the acres of grounds. Despite having been here before, I always get lost in the grounds because the hotel is full of surprises. You wander along a passageway and suddenly encounter a courtyard with fountains. You head in another direction and a garden magically appears. Each guest will find an area of the hotel that he or she likes most, but my personal favourite is Kartikeya’s garden. This area is dominated by an antique statue of Lord Kartikeya, the son of Lord Shiva and Goddess Parvati. The statue guards the entrance to a large garden that is, appropriately enough, full of peacocks. It’s appropriate because the peacock is Kartikeya’s steed. I have no idea whether the peacocks are aware of the connection or whether they just like this part of the hotel, but on each visit to the garden I counted at least six peacocks. In fact, you get the impression that they own the garden and you are just an interloper. No matter how close you get, the peacocks seem unconcerned. This is their own territory. 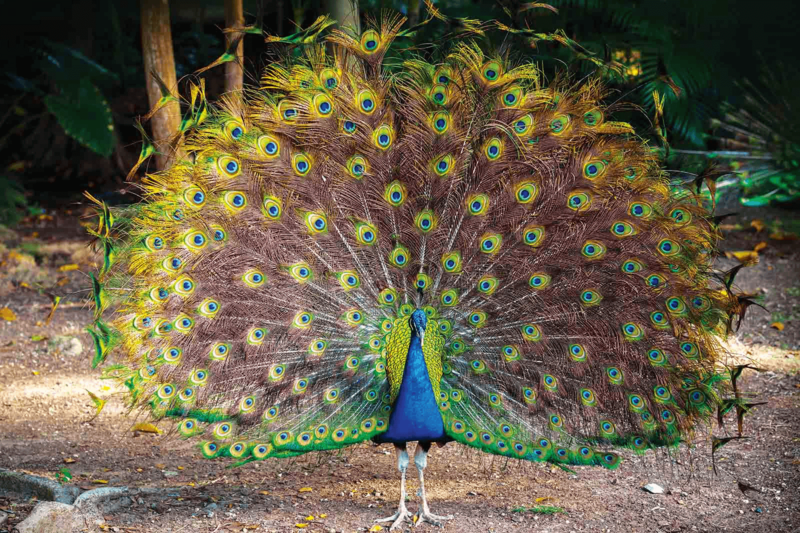 Though peacocks can fly, they can only do so for short distances and not at a very great height. But Kartikeya’s peacocks don’t seem aware of these restrictions. Each day I would see them flying around, and on my last night there, one of them came to the courtyard and pool area outside my room and sat on a tree, watching us closely. Then, as it grew dark, he flew up to the tallest dome in the hotel and perched there, silently silhouetting against the darkening evening sky. It is an image that will live with me for a long time. Because the hunting grounds that The Oberoi Udaivilas, Udaipur, is built on are hundreds of years old, there are many historical structures scattered around the property. My own favourite is a pavilion at the very end of Kartikeya’s garden, overlooking the lake. Apparently, it started out as a hunting lodge or a resting place for the Maharana and his courtiers between shoot expeditions. I am not a fan of hunting, but this structure fascinated me. It was built 200 years ago, and yet survives totally intact, its floors still gleaming in the sunlight. Most days, a peacock or two stand guard near the entrance. I focus mostly on peacocks because of their ethereal beauty but The Oberoi Udaivilas, Udaipur, is an unlikely bird sanctuary of sorts. Each day, I would notice new and unfamiliar birds sitting on the trees. I asked Amit Kaul, the hotel’s General Manager, who is an avid birdwatcher, where these beautiful and unusual birds came from. Amit said that he had personally counted 120 different kinds of birds (which means the total number must be in excess of 200 or so, at the very least) and reckoned that most were migratory in nature. They had flown hundreds of miles from all over the world just to come here. I could see a certain logic to that. Each year, guests fly hundreds and thousands of miles to this fabled resort, so why should birds be an exception? When it was finally the time to leave, I sat down to make a list of all the things I would remember about the hotel. Some of them were not out of the ordinary, at least in a Vilas context. There are three restaurants, the food is and the staff is skilled at setting up meals or snacks in the open-air setout area by the pools (both private and semi-private). In my case, the evening would start at 6.30 pm with the unusual combination of champagne and chaat - the hotel excels at Indian street food. The spa is spectacular - but then I have come to expect nothing less from a Vilas. The staff-members are young, friendly and cheerful. Every single one of them goes out of his or her way to surprise you. Each evening I waited, fascinated to see what Sanchita, the housekeeper attached to my wing, would do. One night, she filled my bed with origami-style animal shapes made from towels. On another, she spelled out ‘good-night’ in rose petals on the floor of my room. And on my final night, she filled my poolside area with fairy lights that glittered in the Udaipur night. 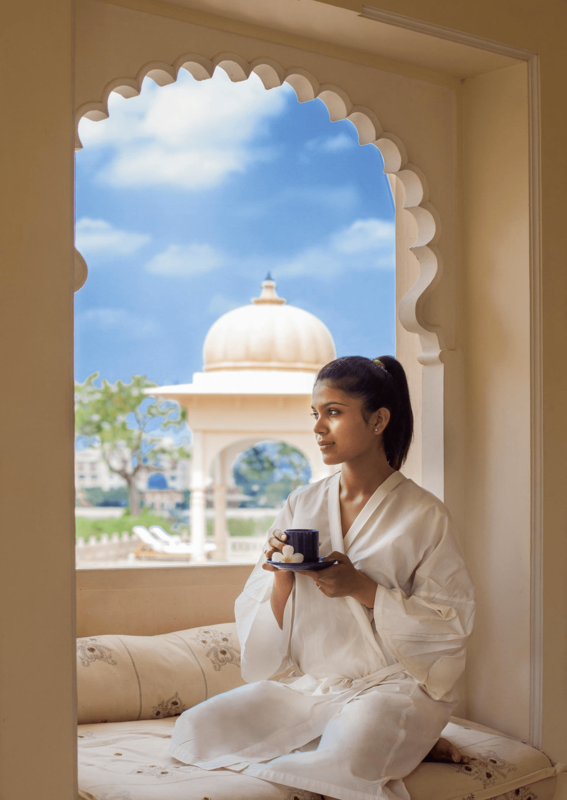 As wonderful as all this was, there are two other things that I will remember most fondly about my stay at The Oberoi Udaivilas, Udaipur. The first is the air of quiet, unobtrusive service. Not only does nobody bother you unnecessarily (everything, from when you want your room cleaned to when you want to eat dinner is bespoke and organised around your convenience) but you never actually bump into staff in the corridors. (Though when you do, they are unfailingly charming). You don’t see servers carrying room service trays and you don’t have to walk around housekeeping carts. I asked Amit how they managed this. After all, servers must have to travel from say, the kitchen to the rooms in this far-flung and spread out hotel. So why did I never see them? Amit told me the secret. Below the guest floors, carved into the rocks of the hill, is another floor. This is where all the services (laundry, kitchen etc.) are located. A series of lifts links this area to the guest floors. So when a server takes the lift up with your breakfast order, he or she rarely has to walk very far because each section has its own lift. It is the kind of detail that most guests will not register at a conscious level. But at a subliminal level, the absence of waiters wandering around with trays or of corridors packed with staff adds to the luxury experience. And, of course, it adds to the air of peace and serenity. What I will remember forever about The Oberoi Udaivilas, Udaipur, is how brilliantly the hotel combines stunningarchitecture with a sense of nature. The gardens, the peacocks, the migratory birds, the waters of the lake, are all unforgettable. The hotel has recognised that while man-made gardens can be wonderful, nothing competes with the wonders of Mother Earth. That’s true luxury: where a hotel is designed to emphasise the beauty of nature while pampering its guests in every way known to man!